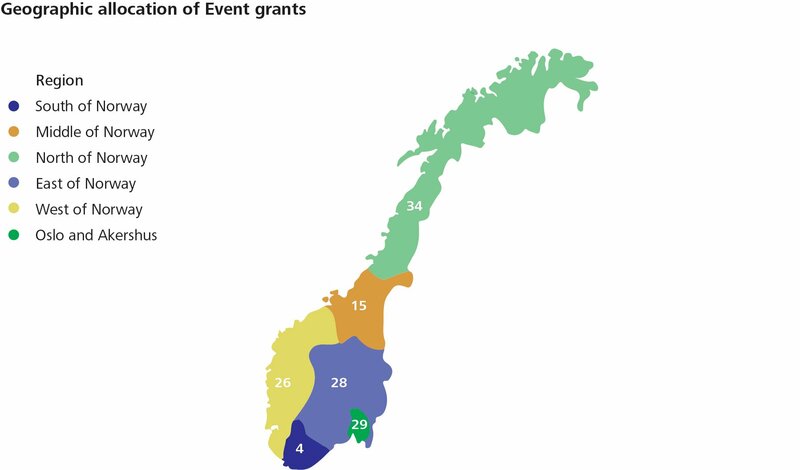 The funding of feature films constituted 64 percent of the total allocated funding from the Norwegian Film Institute in 2017. Drama series and documentaries were granted 13 percent each, while short films and interactive games were granted five percent respectively. If we look at the last ten years as an entity, drama series is the format that together with interactive games, have seen the largest increase in allocated funding, while feature films gradually have received a smaller part of the total funding. The Norwegian Film Institute allocates funding for film projects of differing formats, which in this context mean documentaries, feature films, short films, drama series and interactive games. There are also differing types of funding, divided according to purpose: development, production, funding to promotion in Norway and abroad – in addition to box office bonus. The below tables show how the 2017 applications and grans are allocated according to format and type. NFI received 428 applications for development support in 2017 and NOK 56 million was allocated in total to 173 of the applications. That means that 41 percent of the applications received funding. Out of the 347 applications for production support, 86 were accepted, which equals 25 percent of the total. In total they received NOK 208 million. Furthermore, NOK 27 million was allocated to promotion in Norway, and NOK 8.5 million to the promotion of Norwegian productions abroad. For these support schemes, respectively 86 percent and 90 percent of the applications were accepted. Box office bonus is given to theatrically released films that reach cinema admissions above given levels. Films that qualify can potentially receive funding for three years after theatrical release. In 2017, this was the case for 39 films, including twelve documentaries and one minority co-production. Nine of these films did not receive pre-production support from NFI. Funding to feature films constituted 64 percent of the total allocated means granted in 2017. This is the lowest share measured during the last five years. Drama series and documentaries were granted 13 percent each, while short films and interactive games were granted five percent respectively. Looking at the last ten years in total, drama series is the format that, together with interactive games, has seen the largest increase in funding, while feature films have gradually received a smaller part of the total fund of grant. In 2017 the NFI received 346 applications for production support to all formats. 57 percent of the applications came from production companies in Oslo and Akershus. The other regions that followed were Hordaland and Sør-Trøndelag with eight percent each, Troms with five percent, and Rogaland and Oppland which each made up four percent of the applications. 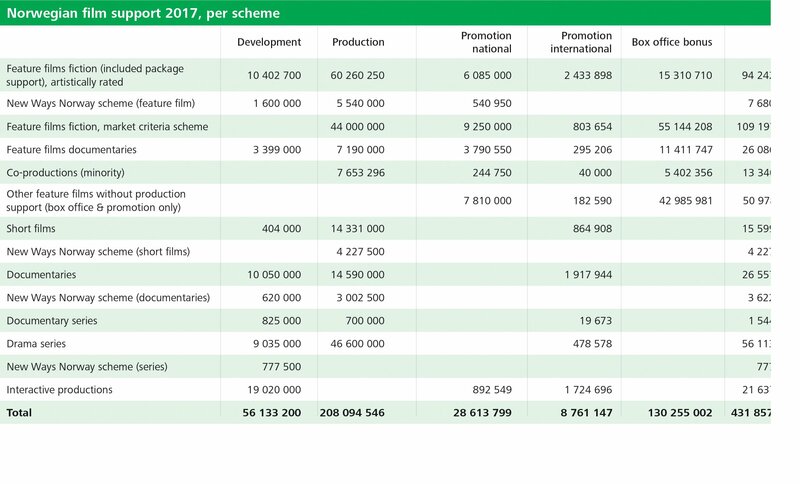 The below figure shows how the NFI's production funding in 2017 was allocated for the various regions.